The U.S. has a long history of accepting immigrants. It can be hard to remember that with the pervasive anti-immigration sentiments pushed by many politicians and news stories these days. But it’s a valuable, vital thing to remember because our nation was built on immigrants seeking a better life for their families. For centuries, the U.S. had a reputation for being a safe place for many immigrants to start afresh, escape persecution, and create better lives. But immigration to the U.S. today looks drastically different than it has in the past. Little more than 100 years ago, those wanting to immigrate to the U.S. could take a ship, come in through Ellis Island, and get straight to work starting their new lives in a new country. Sure, it was a bit more complex than that, but not much. Today, immigrating to the U.S. can take years for an application to even be processed, just for permission to be denied. Even a temporary visa like a student visa or a work visa can take weeks or months to approve or renew. So what are the options for immigrants who need to leave their home country and don’t have years to wait? There are a few different options for those looking to immigrate to the U.S. The best option will depend on personal circumstances, and can play a major role in how quickly or slowly an application is processed. This is why it’s important to work with an immigration lawyer. They can help determine which of the immigration options is the best one for an individual. They can also walk you through the application process, navigate interviews and other requirements, and support you through court time. Temporary Visas — These are visas that come with expiration dates, for people who don’t intend to stay in the U.S. permanently. They include student visas, visitor/tourist visas, pass-through visas, and other similarly temporary situations. Permanent/Extended Visas — These include immigrant visas and permanent resident (green card) applications. Types of immigrant visas include family-based visas, employment-based visas, and the subcategories for green card eligibility. Refugees and Asylum — These options are specifically for those who have fled from or need help escaping persecution or dangerous situations in their home country. Of those options, applying for a green card or a multi-year work visa are popular options and allow immigrants to remain in the U.S. long-term — or permanently, if a green card holder is approved for naturalization down the road. However, those options can be limiting and often rely on having some sort of connection to the U.S. For those who don’t have family or an employment situation that allows them to come to the U.S. and need to leave their home nation for their own safety, asylum may be only option to help them. Immigrants seeking asylum can apply for it at any U.S. port of entry — at border crossings, airports, and so on — or immigrants can seek asylum after gaining entry to the U.S. There are a couple of things that have to happen as part of this process. 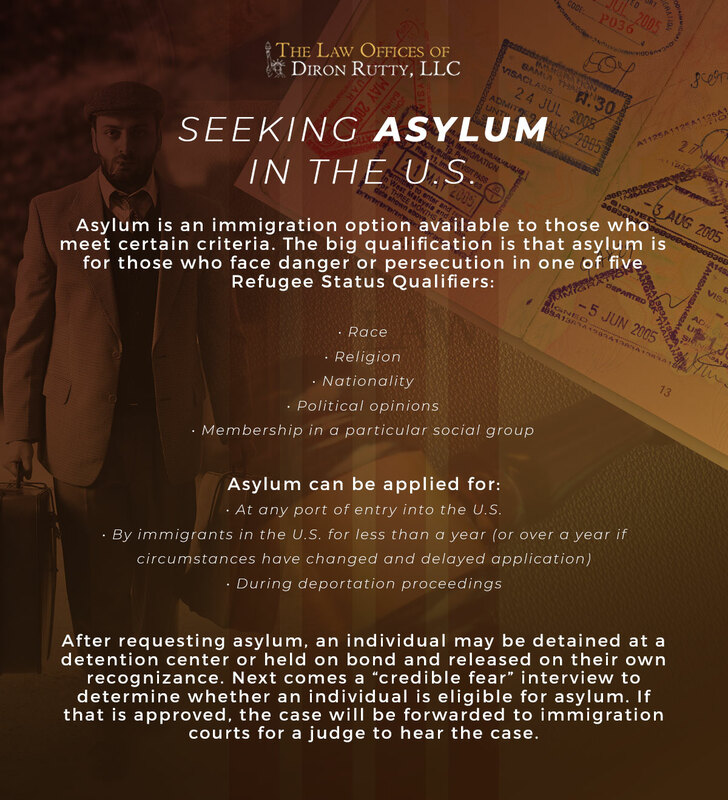 Whether an immigrant is applying at a port of entry or after they are already within U.S. borders, they will have to demonstrate a couple of qualifications to be eligible to claim asylum. First, they will have to show they were in danger of persecution or other harm in their home nation. Second, they will have to show that they are eligible to claim refugee status, which includes facing persecution on the basis of race, religion, political opinion, nationality, or membership in a particular social group (which can include nearly any social group, but often includes members of the LGBT community and groups with similar potential dangers). After requesting asylum, there are further steps each individual will need to complete. Anyone seeking asylum from the U.S. will either be taken to a detention facility or have to pay bond as a means of keeping tabs on them while the request is processed. During this time, each immigrant requesting asylum will go through a “credible-fear” interview, which will help determine if they meet the qualifications of a refugee/asylee. If the immigration courts find they meet those qualifications, their case will then be passed along for further hearings. At any point along this process, if asylum is denied, that individual may be deported. According to the most recent information from the department of U.S. Citizenship and Immigration Services, an immigrant can apply for asylum if they are within the U.S., as long as they do so before they’ve been in the country for a year. There are exceptions made for extenuating circumstances, but those instances are not hugely common. Recently, however, that process has come into question. Before now, immigrants were often able to come into the U.S. and be eligible to work while waiting for their asylum request to be processed. Now, the president wants to shift that process. Instead of being able to apply for asylum from within the U.S. and be able to work while waiting, President Trump wants immigrants seeking asylum to have to wait outside U.S. borders through much of the process. The stated goal is to make it so immigrants can only apply for asylum at U.S. ports of entry (i.e. border crossings, airports, and so on). The proposed changes would also require potential asylees to wait outside the U.S. while their case is processed, which could mean months or years of living in an impermanent place while waiting for word. Currently, the measure to require asylum-seekers to apply only at ports of entry has been blocked in federal court, but the eventual legal decision has not been made about that yet. If you or a loved one is trying to request asylum, it’s important to get help navigating the process — especially in light of pending changes to the process. Officials in charge of processing asylum requests and immigration applications are overloaded and there are “metering” measures in place to limit the number of asylum applications accepted in a day. To make the process go as smoothly as possible, it’s helpful to know how to file and what sorts of information the application should include to support a case. Working with an immigration lawyer can help you seek asylum and work with you to include as much information as possible on the application to help support your case. 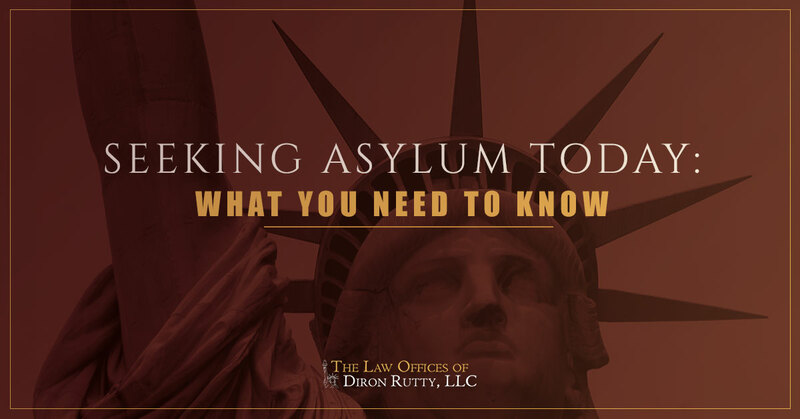 Connect with the Law Offices of Diron Rutty, LLC to speak with an immigration lawyer about seeking asylum.